A ghost is the disembodied spirit of a once-living wizard or witch. Only magical beings can become ghosts. Many ghosts take up residence within Hogwarts Castle. These fleshless spirits were either afraid of death or have some extraordinarily strong connection to the locations they haunt. Sir Nicholas: "Not everyone can come back as a ghost." Sir Nicholas: "...Wizards can leave an imprint of themselves upon the earth, to walk palely where their living selves once trod... But very few wizards choose that path." In their paranormal state, ghosts are unable to have much physical influence. They are visible, and appear as a greyish-silver apparition of their former (living) selves. They pass through solid objects without damaging themselves or the material, but create disturbances in water, fire and air. The temperature drops in the immediate vicinity of a ghost. Their appearance can also turn flames blue. In passing through an object, they may impart a sensation of icy coldness. However, they are apparently moved by gusts of wind, as demonstrated when a petrified Nearly Headless Nick was wafted to the Hospital Wing by a large fan, although this may have been possible due to his petrified state. Ghosts are either capable of, or pretend to be capable of, almost being able to taste rotten food. Ghosts also appear to celebrate their deathday, as Nearly Headless Nick did so on October 31st in 1992. They tend to be very sensitive concerning the circumstances of their death, often showing great hesitancy when asked by others how they died. They are also weightless and may fly in any direction. Ghosts cannot be destroyed, however, they may be petrified with the gaze of a Basilisk. This can be reversed by a Mandrake Restorative Draught, although the method of administration is unclear. In 1996, after Sirius Black's death, Harry had a conversation with Nearly Headless Nick in which he asked if Sirius could come back as a ghost like others and Nick himself. Sir Nicholas explained that only wizards who fear death are likely to become ghosts. As ghosts are imprints of souls of the said deceased wizards and witches, they are unable to move beyond the veil, and are forever trapped in the world of living as intangible beings. Due to this, few would choose this path. Depending on the conditions of the person's soul, they may not be able to return, as Tom Riddle's self-mutilated soul is trapped in limbo for eternity and cannot become a ghost. The Ministry of Magic seems to have at least a degree of power and jurisdiction over ghosts, as Moaning Myrtle was forced to return to her place of death, which was Hogwarts School of Witchcraft and Wizardry, when she disrupted the wedding of the brother of Olive Hornby. The Spirit Division is the division of the Department for Regulation and Control of Magical Creatures deals with ghost welfare. Each House at Hogwarts has a patron ghost. Each of these ghosts once belonged to their corresponding House. They apparently serve as a representative to their House, as well as serving the role of messenger or guide to those who are still unfamiliar with the House they were sorted into. It is unknown for how long they may retain this title. The Gryffindor house ghost is Nearly Headless Nick. He is known as a friendly ghost who was nearly beheaded, but the job was poorly executed, which was how he obtained the nickname of "Nearly Headless Nick". He prefers to be addressed as "Sir Nicholas". His real name is Sir Nicholas De Mimsy-Porpington. The Hufflepuff ghost is the Fat Friar. He is known for being friendly and jolly to all. He also frequently suggests that Peeves should have a second chance, whether or not he deserves it. 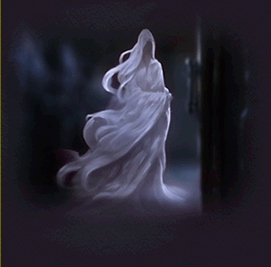 The Ravenclaw house ghost is the Grey Lady, also known as Helena Ravenclaw. She was the daughter of Rowena Ravenclaw, making her the only house ghost to be directly related to one of the four Hogwarts founders. She is renowned for being instrumental in assisting Harry Potter in the search for the Horcruxes. The Slytherin house ghost is the Bloody Baron. He is well known for being extremely unsocial and many students, including those of his own House, are known to be slightly afraid of him. The Baron is also the only one known to be able to control Peeves. The Bloody Baron is responsible for the death of Helena Ravenclaw as well. In the video game, Harry Potter: Quidditch World Cup, a ghost named Edgar Clogg haunts the Quidditch pitch and provides coaching. Professor Amberose Swott may have become a ghost after death. According to W.O.M.B.A.T., ghosts may have the ability to move liquid or gas. J. K. Rowling used the term 'Ghost Plots' for the stories that never mentioned or yet published in any books. The ghosts Edmund Grubb, the Black Knight and The Toad were cut from final drafts. It is possible that while ghosts might be silver-greyish to the living, it is possible that through their eyes, they see themselves and each other the way they looked alive, as Nearly Headless Nick was able to read a Ghost letter that appeared to be transparent to Harry, meaning that he could not see any written text on it, even if Sir Nicholas could. Although Killing rips the soul, true remorse can heal it again. One example would be the case of The Bloody Baron as he killed Helena Ravenclaw, but felt remorse over her death, thus he was able to come back as a ghost. ↑ Pottermore - New from J.K. Rowling: "Ghosts"
This page was last edited on 14 July 2015, at 12:15. This text is available under the GNU FDL and may have been adapted from the Wikipedia article about Ghost (history).